You're a farmer now, and it's high time to gather the cows from the herd. Mow is a clever and fun little game. Very easy and fast, this card game has pretty illustrations and lends itself to tactical moves and small messes making the whole thing quite funny and exciting. Your goal is to collect as little fly as possible from your barn. The "Cows" cards that will be placed by each player have more or less flies surrounding the cows and a value from 1 to 16. 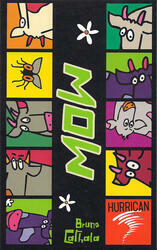 A herd is started by placing a first card in the center of the table. Then each player will have to continue the sequence (increase the herd) by placing a card at the top or bottom of the current sequence. If you can't put a card down, then you must retrieve the herd (and its flies, so all the cards in the suite) and restart a new suite. Special cows decorate the game, they are interspersed, superimposed, etc. Mow can be taken everywhere and is ideal for parties with family or friends. Contents of the box : 110 cards, rulers in 60 languages, 1 pencil, 1 pad of paper.